It is normal for any person to shed hair during their daily lives. About 10% of the hair on our scalp is in resting phase, while the other 90% is growing. The 10% that is in a resting phase will stay in that phase for 3 to 4 months, after that point, it will fall off and new hair will begin to grow. Hair Loss occurs when the hair falling out is slowly being replaced by new hair. Anyone at any age can experience hair loss. A number of things can cause hair loss. After a major surgery or illness, one may experience hair loss. This is the cause of stress and is not permanent. A hormone imbalance may also be the cause of hair loss. Correcting the imbalance may stop hair loss. An overactive or under active thyroid gland may cause hair loss as well. Many women notice hair loss a couple of months after pregnancy. This is also hormone related. During pregnancy, certain hormones cause the body to keep hair that would normally fall out. When the hormones return to normal, the hair that was kept during pregnancy falls out and the normal cycle will start again. Infections may also cause hair loss. Fungal scalp infections can cause hair loss in children. Anti-fungal medications will clear this up. Some medications can cause hair loss. Blood thinners, diabetes medication, medicines for gout, high blood pressure, and heart problems have been known to cause hair loss. Certain hair styles can also cause hair loss. Pig tails and Cornrows are known to cause hair loss. Hair loss due to this pulling is known as traction alopecia. If the pulling is stopped before scarring occurs, hair will grow normally. Hot oil treatments or chemical treatments may cause swelling of the hair follicle, this swelling can result in hair loss. Common baldness, also known as androgenetic alopecia, is the most common cause of baldness in men. This type of baldness is usually an inherited trait. In this type of baldness, hair loss usually results in a receding hair line and baldness on top of the head. Is there a treatment for hair loss? Depending on the type of hair loss, there are treatments available. If medication is the cause of hair loss, your doctor can likely prescribe a different medication. Medicine can also help slow or prevent hair loss. 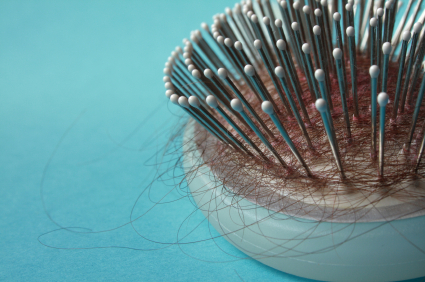 Treating an infection or a hormone imbalance may prevent further hair loss. It is quite possible that genetics play a roll in hair loss. German researchers say that a variant on the androgen receptor is required for hair loss to occur. Another gene that is thought to cause hair loss is the P2RY5 gene. This gene has been linked to hair structure, so it is possible that a variation on the gene may cause hair loss. Hair Genesis - Hair Genesis is a natural hair loss remedy that contains dihydrotestosterone blockers which helps prevent hair loss. Minoxidil - Minoxidil is an FDA approved drug that has been known to be very effective in treating the thinning of hair. Revivogen - Revivogen is a collection of tropical hair loss treatment products that have proven effective in treating hair loss. Propecia - Propecia is the only FDA approved drug that is effective in treating permanent baldness. GLH Spray - GLH spray is not a permanent treatment, but it is great for concealing hair loss. An advantage to this spray is that it does not easily rub off.